On June 21, myself and a car full for friends drove down to Calgary to partake in the somewhat local X-Wing Regionals hosted out of Sentry Box. This was the largest event in the area so far with only store championships before it. We were also all eager to meet and play others from outside our own group. The day started out early since we drove down the day of the event and had to be on the road by 6am to make sure we’re made it on time for the registration. The list I brought was an Imperial list with the following. Kath Scarlett with a rebel captive and expert handling, Howlrunner with swarm tactics and 3 obsidian ties. Game one started and my opponent was a player names James that came up to the event from Lethbridge. He only had a two ship rebel fleet consisting of Han Solo in the Falcon and a named A-Wing ship. We pretty much lined up straight across the board from each other and went forward. His A-Wing zoomed up really close and the Falcon boosted into a strange angle towards the board edge. I managed to line up most of my shots against the A-Wing and blew him out of the sky. The falcon did a few shots on one of my ties but I weathered the storm. 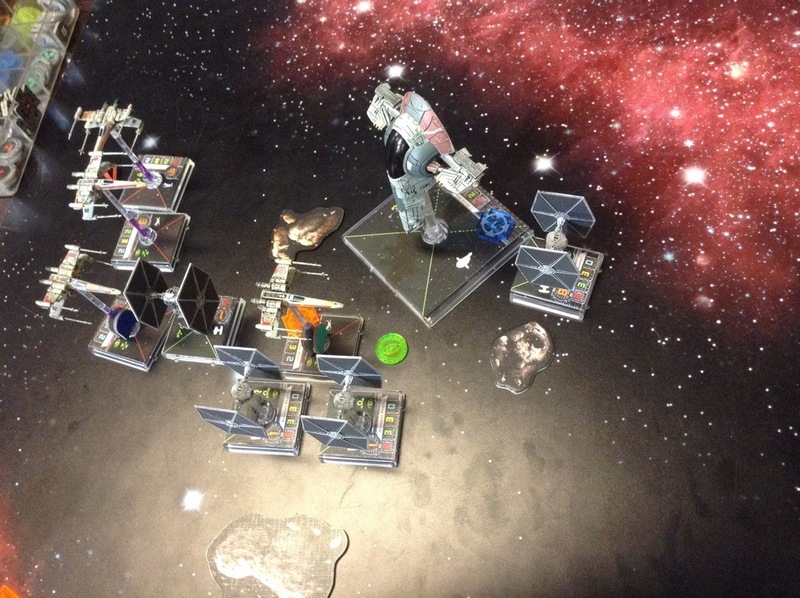 The following turn I managed to position one of my ties in a way that blocked the falcon from turning completely and forced his back end off the board. It was a very quick game which allowed us to get an extra fun game in just because. Game 3 saw me face off against another player from Lethbridge. 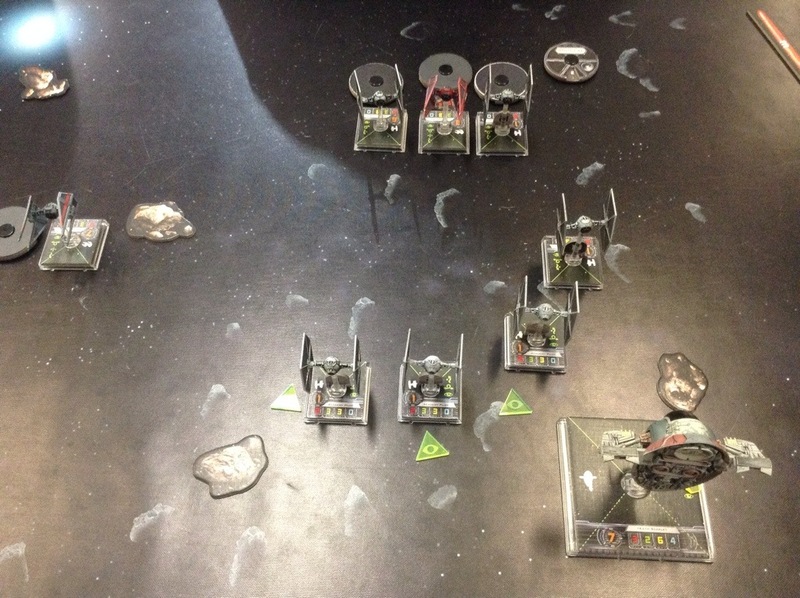 Wallie brought an Imperial list with two Interceptors, a few ties and dark curse. We almost lined up straight across from each other with the exception that one of his interceptors was going to try and flank me. We start the game and in turn two it goes a little south for him. His flanking interceptor makes too sharp of a turn and ends up sitting on an asteroid that manages to do a direct hit on him. A couple of my ties end up in arc and range and manage to finish it off. His other interceptor comes straight up and Kath got a barrel roll in right in front of him. Boom! Both interceptors out. After that I lost all my luck. I could not touch dark curse and had some rough defensive rolls that saw my ties blown out of the sky. When time was called he was up 17 points on me and got the win. It was a very back and forth game which was exciting. My last game of the day was against another Imperial player named Nick. Nick was running a tie swarm with Howlrunner and a bunch of ties. We both ended up cutting into the Center if the board to duke it out. It ended up being a slug fest for both sides with some turns doing nothing for either side. Eventually I managed some lucky rolls and got his Howlrunner out early on. This game ended up being the most fun for me at the event I did manage to get a victory out of it when time was called. There were so many ties running into each other it was such a traffic jam. After all the space debris cleared, prizes were awarded. I managed to just get into the top 16 with a 2-2 record and score myself a set of tokens. As I already have tons of litko tokens already, I gave my set to Nick who was my most fun opponent that day. Everyone else that came down in the car also managed to make top 16 and Dan made top 8 to also get a set of fancy clear X-Wing dice. We all had an awesome time at the Sentry Box and hope to make it down to Calgary for future events! Jarrett Lee on Back at it! wardkapach on Back at it!